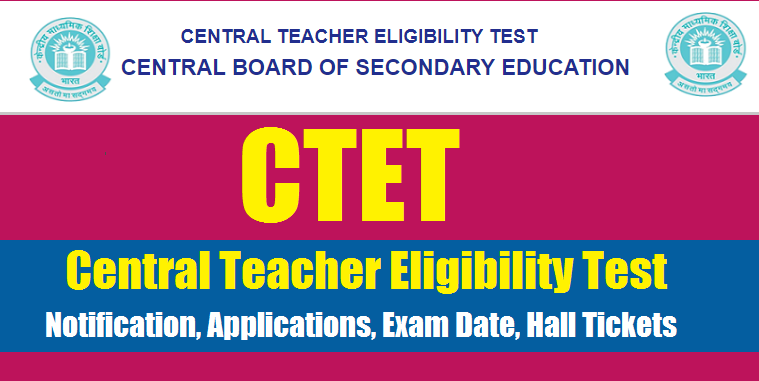 Teacher Eligibility Test (CTET) on 07-07-2019 (Sunday). The test will be conducted in twenty languages in 97 cities all over the country. The detailed Information Bulletin containing details of examination, syllabus, languages, eligibility criteria, examination fee, examination cities and important dates will be available on CTET official website www.ctet.nic.in w.e.f. 05-02-2019 and the aspiring candidates are requested to download the Information Bulletin from above mentioned website only and read the same carefully before applying. The aspiring candidates have to apply online only through CTET website www.ctet.nic.in. The online application process will start from 05-02-2019. Last Date for submission of online application form is 12.03.2019 upto 5.00 P.M. and fee payment is 15.03.2019 upto 3.30 P.M..
i. Relaxation up to 5% in the qualifying marks in the minimum Educational Qualification for eligibility shall be allowed to the candidates belonging to reserved categories, such as SC/ ST/ OBC/Differently abled. ii. Diploma/Degree Course in Teacher Education: For the purposes of this Notification, a Diploma/ Degree course in teacher education recognized by the National Council for Teacher Education (NCTE) only shall be considered. However, in case of Diploma in Education (Special Education) and B.ED (Special Education), a course recognized by the Rehabilitation Council of India (RCI) only shall be considered. iv. The minimum qualifications referred above apply to teachers of Languages, Social Studies/Social Science, Mathematics, Science etc. In respect of teachers for Physical Education, the minimum. qualification norms for Physical Education teachers referred to in NCTE Regulation, dated 3rd November, 2001 (as amended from time to time) shall be applicable. For teachers of Art Education, Craft Education, Home Science, Work Education, etc. the existing eligibility norms prescribed by the State Governments and other school managements shall be applicable till such time the NCTE lays down the minimum qualifications in respect of such teachers. (i) The CTET shall apply to schools of the Central Government (KVS, NVS, Central Tibetan Schools,etc.) and schools under the administrative control of UT’s of Chandigarh, Dadra & Nagar Haveli, Daman & Diu and Andaman & Nicobar Islands, Lakshadweep and NCTof Delhi. consider the CTET if it decides not to conduct the State TET. State Government in accordance with the Guidelines framed by the NCTE for this purpose. Last Date for submission of online application form is 12.03.2019 upto 5.00 P.M. and fee payment is 15.03.2019 upto 3.30 P.M. In case confirmation page is not generated after depositing the requisite fees, the candidate should approach the Assistant Secretary (Exam. ), CTET Unit, CBSE between 10:00 A.M. to 5:00 P.M. from 10 days beofre the commencement of CTET Exam along with CTET - 2019 proof of payment of fee i.e. candidate copy of E-Challan, if payment made through E-Challan or copy of bank statement, if payment made through Credit/Debit Card for considering his/her candidature for CTET - 2019 examination. The candidates shall report at the Examination Centre 90 minutes before the commencement of the examination. Candidate report at the examination centre after 9:30 AM shall not be allowed to sit in Paper II and candidate report after 2:00 PM shall not be allowed to sit in Paper I.